Liferay is an open source platform started in 2000, long before the term “Web API” existed. 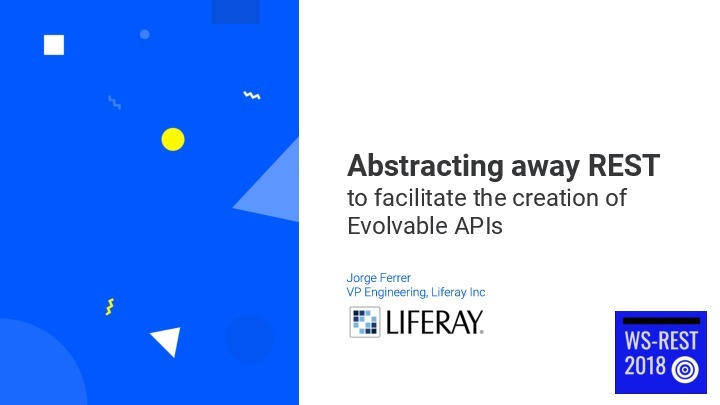 One early characteristic of Liferay has been its great extensibility, which included providing a featureful HTTP API to access its functionalities since the very beginning. Initially this API used SOAP (as well as other less used protocols). Later a new “RESTful” option was added, leveraging HTTP+JSON and it became much more popular (even though it was at Level 0 in Richardson Maturity Model). However, both approaches lead users of the API to have a high coupling that makes the evolution of the APIs a challenging task. So we started wondering, isn’t there a better way to build APIs in 2017? This session explains our search to find a better alternative and what we learned along the way. It focuses on how we have adopted Hypermedia and Shared Vocabularies to create a new breed of APIs that we believe form the secret ingredients that solve the most important challenge we have in the API Economy: evolvability. We are now successfully applying this type of APIs in all of our products, on premise, cloud based, … even internal. We have found that once you know how and build some common foundation, all the barriers to build evolvable APIs disappear. We learned from many others along the way and want to contribute back by sharing our experience.